Over the past few seasons there has been a lot of new energy and inspired projects down at the ‘compound’. 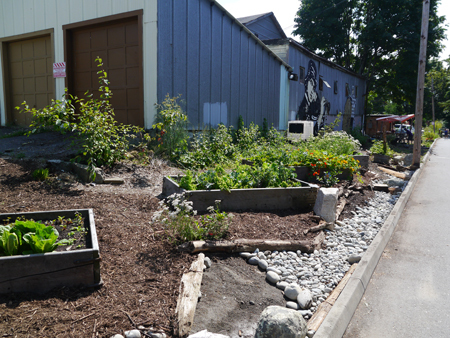 One of the more long term efforts has been to create a community food garden and functioning rain garden in the landscape. 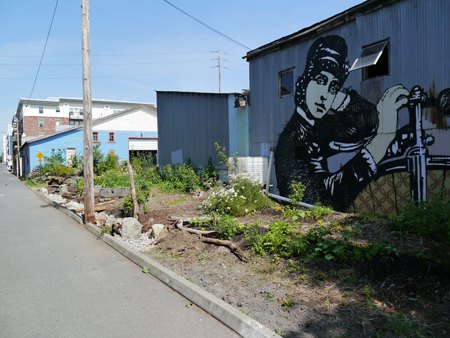 Inspired by all the people that use the bike path and live in the subsidized housing next door, Nick Spring of BUGS, Bellingham Urban Garden Syndicate, realized the potential of contributing a food garden to the area. Similarly, Bay of Plantas Nativa saw the value of creating a rain garden that would capture and filter the high volume of storm water that flows off our rooftops and driveways before making it’s way to the fragile shoreline below us. A portion of that water will also be collected in barrels and used for watering the plants. Through occasional work parties and creative ideas, we are slowly transforming the area into an alternative model that supports our local community and independent business district. 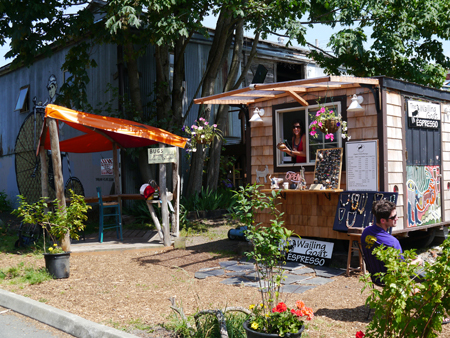 And on the South end of the garden is a farm stand and the delicious Wailing Goat Espresso, which also sells jewelry and pottery made here.